Spacious house high up in the old town area of Oliva. Oliva is an unspoilt market town which is in the 'Oranges and Lemons' region of Valencia, midway between Alicante and Valencia. It's on the southern tip of the Costa del Azahar - 5 miles away from the beginning of the Costa Blanca. The house is just 5 minute's drive from the magnificent uncrowded beach, which stretches 10 kilometres. Upstairs - the terraced house has one large double room, another room with 2 single beds, a modern shower room and a toilet. Downstairs - there's a large front room/dining room (with a wood burning stove for the winter), a modern kitchen and a modern bathroom with toilet, bidet and bath/shower. Marble tiles throughout. The front room contains a bed settee which can sleep another 2 people. 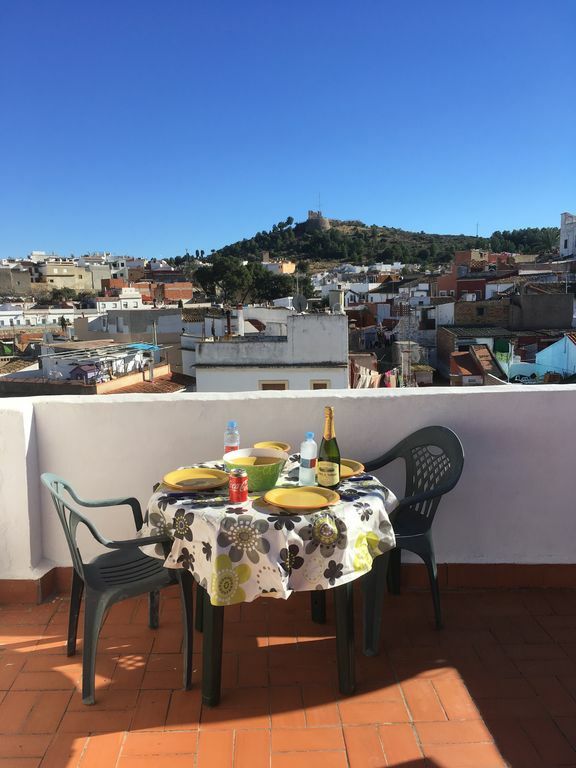 The 2 large roof terraces have good views over the town, Oliva castle, the mountains, and can also see the sea. 75 km from Valencia airport, 100 km from Alicante Airport. Portable electric heaters are provided for the winter months. Towels are provided for use in the house, but not for the beach. Small selection of board games. There is a selection of DVDs. The house is on a quiet cul-de-sac. The street is too narrow for parking but there are spaces on surrounding streets. The town centre is 5-10 minutes walk from the house, down a gentle hill that may be a little too steep for elderly or infirm people or very young children. Very spacious and conveniently located townhouse. The townhouse had all necessary equipment and was airy and spacious. David provides excellent instructions on using the accommodation. It is well located for easy access to all facilities. Even though we used the apartment in winter there was more than sufficient heaters to stay warm. We stayed for 2 months, April and May. The house was as advertised - spacious, clean and well equipped. It is in a residential cul de sac off a quiet street - you need to park in a street nearby. The terraces are lovely, with spectacular views of land and sea from the top one. There is always sun and shade whatever time of day. The house is traditionally built but the utilities are modern. No air conditioning but fans in all rooms. Gail, the caretaker, is very helpful and a mine of local information as she used to live nearby. There are three bars within minutes - Pelut is Spanish owned and has a restaurant as well which is lovely. Cafe Molino is a hub for expats -British and other nationalities but Spanish people use it too. The owners are delightful and are developing the light food and tapas menus, as well as doing a splendid Sunday lunch. Nikki’s is a characterful bar with a warm welcome and again good advice to be had. The town centre is 15 mins walk and has lots of shopping and cafes and restaurants. You need a car for the beach really, although a bus does run from the paseo. There’s always something going on - processions, exhibitions, fireworks at every opportunity. The local Tourist office has a monthly events sheet that gives you all the details. We loved our stay in Oliva and the house was very comfortable. The landlord is very efficient at keeping in contact and the few minor problems we had - lightbulbs, that kind of thing - were sorted out quickly. If you want a holiday in a real Spanish environment this will provide it, just be aware that the house is on a steepish hill and may not be suitable if you have mobility problems. Otherwise, get fit and enjoy the views! Met at the end of toll road by Gail who we luckily followed to the property , narrow windy streets in the old town of Oliva. House large and had everything we needed for our stay, including ample kitchen equipment. Bed was comfortable and had towels and extra blankets. We stayed in January so evenings got cold but had gas heater in lounge and an electric one in bedroom if we needed it. House comfortable, had English sky tv and WiFi which all worked well. Gail keep in touch if we needed anything. Lovely restaurant just around the corner, friendly and good food and we ate there most evenings. The main town literally straight down a few roads with shops, bars, restaurants and atms. The roof terrace was very large and got the sun all day, was warm enough to sunbathe one afternoon! Negotiating the way out of town was bit scary first time as lots of narrow one way streets but just go for it, it was fine. Few little English bars down the road where friendly and informative. This property was perfect for our use. If you want to experience a true valacian house living amongst the locals, this is the place to do it. If you want penthouse luxury look elsewhere! The house is spacious and equipped for all your needs. The beds are comfy, well the double one is didn't sample others. There is English TV and wifi. There is also a log fire which we made use of our one rainey day. There are three different level roof terraces for all day sun, one with BBQ. Shops, bars and restaurants are within easy stroll with more further a field. The beach is a good 40 minute walk but it is a lovely walk and quicker by car. The local streets are like a maze with one way and no entry not so fun in a car but great to explore on foot! We did find our way out and back by car, no parking directly outside the house but street parking available relatively close. We were met by house manager at the toll booths, we then followed her to the house. Just follow instructions about contacting her the week before your visit. It was the Fallas festival while we were there, it's s festival of fire, children were setting firecrackers off during the week, we saw the statues that they build but left on the Saturday am before the main celebrations on the Saturday and Sunday night. As well as exploring the village on foot ( there are historic trails to follow) we visited Gandia, Denia and also took a trip into the mountains, beautiful scenery with hair raising drops. But with good weather you can just chill on the roof terrace. Oliva is in the 'Orange blossom coast' of Spain. Within a few minutes drive from the house you will find orange and lemon groves, mountains, miles of beautiful beaches and many lovely towns and villages. If you fancy something more 'touristy' you could drive south towards Benidorm and Alicante, where you will soon find many facilities for tourists, including a large theme park. There are plenty of more sedate activities nearby, including golfing and yachting. Going north from Oliva will take you into Valencia, which is Spain's third largest city and is well worth a visit. The full rental is payable four weeks before your holiday. £100 deposit payable when you make the booking. This deposit is for loss, damage, accidents etc and will be refunded within a month of your return from holiday. It will not be refunded if you cancel your holiday without reasonable notice. We provide linen and also towels for the house, but not for the beach.